"No child ever died yet from not getting a pony." These were the famous last words of the cold-hearted parents in Shel Silverstein's poem "Little Abigail and the Beautiful Pony." Little Abigail, of course, did expire, "all because of a pony/that her parents wouldn't buy." I fell in love with horses sometime in my elementary-school years, and as I was not inclined to waste away due to the lack of a pony, I did what any horse-crazy girl would do and filled in as best I could with everything-but-the-horse. Horse books. Model horses. Horse posters on the wall. Horse magazines. Galloping around the yard with a like-minded friend, neighing loudly and jumping over fence poles. Drawing horses, reading about horses, writing about horses, gazing at horses from the car window. Dreaming about horses. 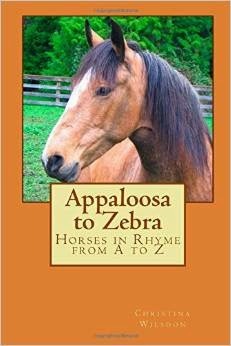 Fast-forward many decades, and today, September 28, 2010--well, no, I still don't have a horse, but I am celebrating the publication of the book I started writing, in a way, when I was ten. 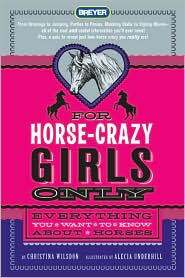 It's called For Horse-Crazy Girls Only, and it's just been published by Feiwel & Friends. When you're a kid living in a city or a suburb, and horses are a rare sight, let alone an animal you could possibly own, you make do with what you've got. I vaguely recall making a life-size horse to put on the basement wall, carefully cutting its parts out of construction paper and taping them together. I made a smaller clay horse, too, as well as its barn and paddock, and dutifully filled its hay net with grass every morning and evening. My small Britains horses and the larger Breyer horses got names and bloodlines. 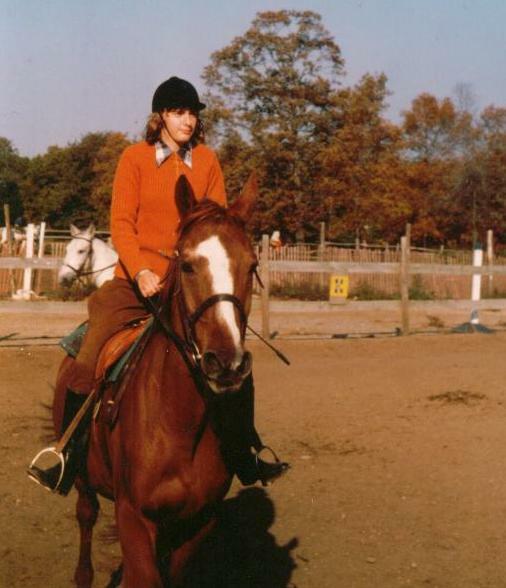 I frequently brought carrots to Whiskey, a chestnut horse who lived alone at a camp next door to my junior high school. And I wrote a stirring saga called Diablo, all about a wild black stallion, who thundered across 60 pages in company with just about every stereotype you'll find in the world of horse and pony stories. George in upstate New York. Yes, I know. What grace! What style! What form! I recall being transfixed with joy. Which would account for the generally dazed expression. ﻿ I was luckier than many horse-crazy girls, though. My parents indulged my love of horses as best they could in a household that included three other children. Although my father wouldn't buy the neighbor's house and knock it down so as to create a pasture next door (in our adamantly not-zoned-for-horses suburb), he did sign me up for riding lessons at Stonyhill Farms and Riding School. I can still remember nearly every horse I rode there: big, rawboned, jugheaded Harley, who had scarcely any tail and was surely part Percheron; clever, responsive Charger, a flea-bitten gray who was usually a joy to ride but got the bit in his teeth one day and ran away with me; clueless Snowflake, who reared up one day when I was completely out of control, causing me to tumble off backwards; British Sterling, a beautiful, young, dark gray horse who I don't think spent much time working as a school horse and went on to a more showy career; and beloved High Step, a willing, patient, but skeptical chestnut. High Step trod on my foot once, and I jagged his mouth with the bit once (an action I still regret; but I guess we're even). 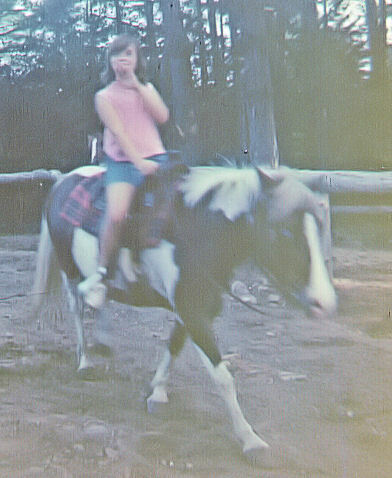 On vacations, my parents dutifully sought out opportunities for me to go on trail rides. They also rose early on occasional Saturday mornings in summer to take me to Belmont Racetrack to watch horses work out before the morning mist evaporated. This treat was part of a program called "Breakfast at Belmont," which included marvelous swag such as booklets about racing, buttons featuring Belmont Stakes winners, and the like. I remember seeing the great Forego striding through his workout. a quick-thinking riding instructor, it wasn't. ﻿ Then came college, and career, and living in New York City, where the only horses were the ones you felt sorry for as they pulled carriages through Central Park. A move to a west coast city didn't bring horses any closer in daily life. Ahh, but raising another horse-crazy girl--that was the ticket. Now I get to see horses every week just by virtue of driving my daughter to and from riding lessons. I no longer feel as if I want to ride horses anymore. (Which may be the result of nearly getting bucked off by one a few years ago--I'm just saying.) But since my daughter's planning to own an equestrian center someday, maybe I'll at least have a horse I can groom--she's promised to board it for me. Mostly for free, I think. Well, even if I have to settle for a Butterscotch Hasbro pony, I'm very pleased to have written this book. 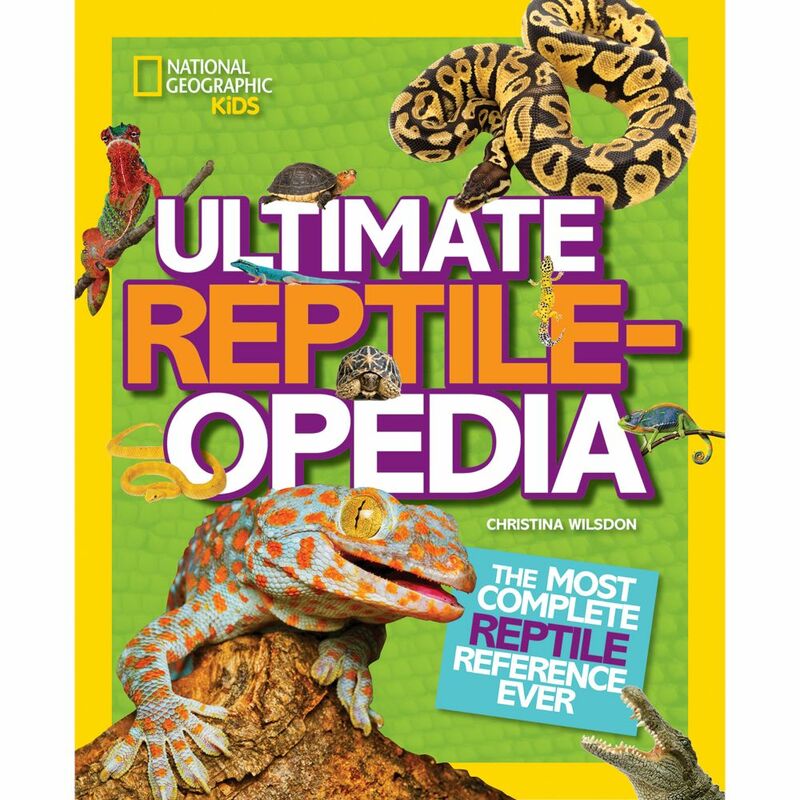 I hope it brings a lot of joy to the latest generation of horse-crazy girls. What a great story. It's so much fun to read your words. Congratulations on the book! Just came across this page when I searched for Harley and High Step and Stonyhill. I rode them in lessons as well! Did you have Crystal as a teacher as well! Great place with great memories. Thanks for that photo of High Step, too! I think that photo of High Step is one of probably only 3 photos my parents ever took at the stable, sadly...I didn't have a camera then, and film would have been something we'd conserve (gotta love today's digital option...I know I'd have a zillion pix of all the horses I rode). I couldn't find much information about Stonyhill online. I think last I checked, it was still a stable but had a new name? I know all the horses we rode are long gone--I hope they somehow managed to have nice retirements, unlike many school horses. Did you ever volunteer there or work there? My daughter did loads of volunteering at her stable here, and I imagine a lot of stables rely on horse-mad kids helping out and that probably Stonyhill was no exception. P.s. dud a new search and yes, apparently Stonyhill is alive and well! Hi again, Christina. I was actually back on LI for the last few days but didn't get to Northport. The last time I drove by Stonyhill it was definitely still a stable (a few years ago). That's funny about the box of helmets! Yeah, I don't think that would fly these days...not exactly sanitary! And, yes, I did "work" there. I considered it my first job! I was in elementary school and mucked out the stalls in order to ride free. I don't think it lasted too long. Did you ever enter one of their shows? That was a real thrill...kind of stressful...but exciting to compete in a "Walk, trot, canter" or whatever. I remember also falling off during a lesson...just as my horse was going over a small jump...and the person coming up behind me went right over me. Pretty memorable and no one got hurt! Well, it's great to think back to those times...and know that someone else out there never forgot those horses! I do remember that the owners were the Hutzlers (sp?). Harry Hutzler I believe? I hadn't thought about Harley and High step until the other day when I was thinking that this stray cat we now have has a roman nose. Then I remembered that the first time I heard that term was when someone at Stonyhill was pointing out how High Step had one...and that prompted me to Google their names! Well, great connecting with you...and if you come up with any of the other horse names let me know. And if I find any old photos I'll let you know! Oh...almost forgot to ask if you knew about Ketcham's Pony Farm down the road...a smaller stable that also gave lessons. I do recall how Harley had the most amazing Roman nose! That boy had to be half Percheron. Tall, Roman-nosed, and as I recall, hardly any tail at all. He really didn't have a lot going for him in the looks department but as I recall he was pretty cooperative and calm. High Step was such a good boy. Gosh, I wish I could remember more names, too. I do recall what a thrill it was to go in each Saturday, and find the little penciled-in list on the wall telling you what horse you'd have. I do recall Ketcham's--I think a friend of mine rode there. Stonyhill has a facebook page I see--not very active but some nice pictures. If you look I think you'll find two pages--one old, and one new with, I think, an LLC added to the name. Wonder if they remember more of the horses...I guess if it's new ownership, probably not.